*WARNING: The following article contains language that may be disturbing. Discretion is advised. 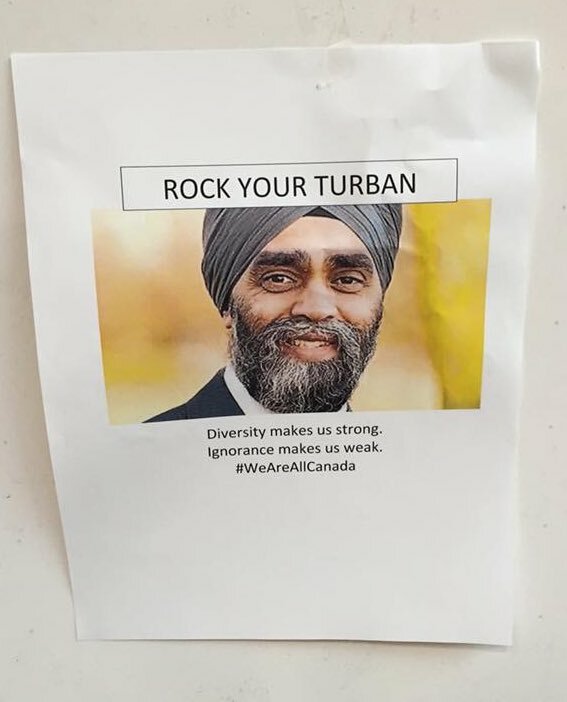 Just one day after at least a dozen disturbing posters were spotted on the University of Alberta campus, political and cultural leaders along with Canadians in general are rallying behind the Sikh community. “We’ve seen a huge outpouring of support from the community, the U of A community and the ethnic community at large,” Arundeep Singh Sandhu, a spokesperson for the World Sikh Organization, said on Tuesday. “Even the prime minister has come out against it, the mayor, as well as of course everyday Edmontonians and Canadians have come out against it. 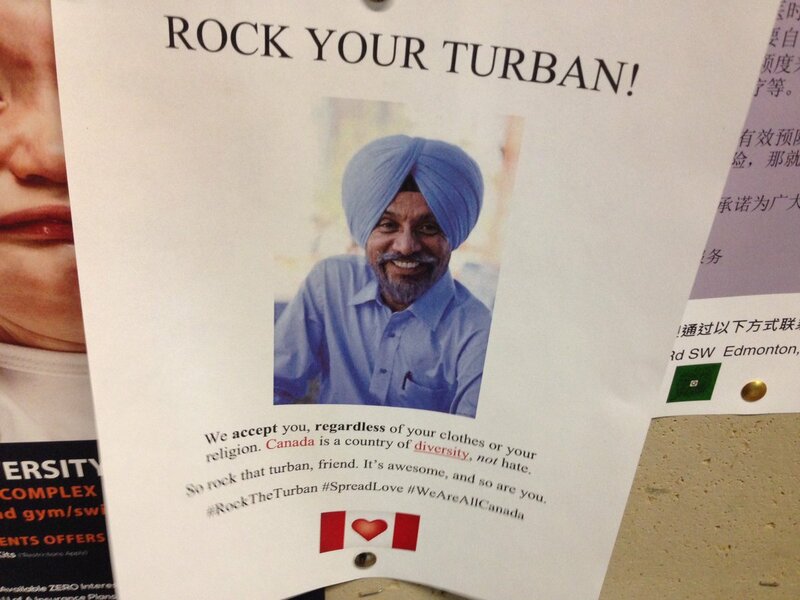 The posters feature a photo of a man with a beard and wearing a turban. The headline reads: “Fu*k Your Turban.” Below the photo, the caption reads: “If you’re so obsessed with your third-world culture, go the fu*k back to where you came from!” The hashtags “Non-Integrative” and “Invasion” are also used. The website ImmigrationWatchCanada.org is included at the bottom of the poster. When reached for comment, a spokesperson for the group denied any affiliation with the posters. Once the university became aware of the posters, they were taken down. At least 12 posters were removed on Monday. The university said no new posters were found on Tuesday. An event to respond to the posters is being planned for next Tuesday, tentatively at the University of Alberta campus between 11 a.m. and 2 p.m.
Free books will also be available that explain more about Sikh history in Canada and the significance of the turban. On Tuesday, different versions of the posters were circulating online. They had apparently been posted on campus in response to the other posters. Edmonton’s mayor responded to the posters on Monday through a social media message and again expressed his thoughts on Tuesday. “It’s disappointing to see this stuff and I think the strong public condemnation, the quick action by the university to take it down, the round criticism from all quarters every time something like this happens begins to send the signal that we are making it awkward for these people who have these outmoded and ridiculous perspectives of newcomers to our country,” Don Iveson said. The president of the university also said the posters are unacceptable. David Turpin said the school does not know who posted them, but they did so without approval. Still, in the wake of disappointment, Turpin said the reaction to this incident has offered hope. “The response of the university community has been remarkable. They have reached out to our Sikh community, in particular. They have reached out to other minorities on campus and made them feel welcome and celebrated the cultural diversity that the University of Alberta is known for. Turpin is also looking forward to Tuesday’s event.